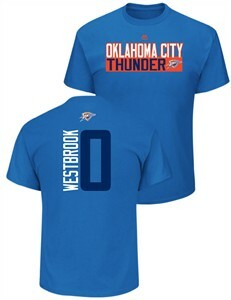 If you want to show everyone what team and player you root, then the Russell Westbrook Oklahoma City Thunder Vertical Short Sleeve T Shirt shouts it out on the full-chest team graphic and on the back graphic featuring his name and number in vertical striping. Made by Majestic from the Players Collection the Vertical short sleeve tee comes in Sport Royal with a body made from 6.52 oz. 100% cotton jersey material with a regular fit, short sleeves, and a tagless collar.